SYNOPSIS: Cassidy Blake’s parents are The Inspectres, a (somewhat inept) ghost-hunting team. But Cass herself can REALLY see ghosts. In fact, her best friend, Jacob, just happens to be one. 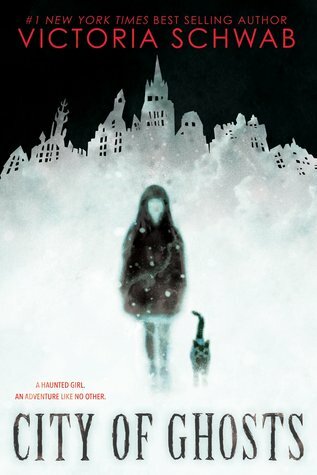 As someone who loves ghost stories, stories set in Scotland, middle grade horror, and Victoria Schwab, City of Ghosts is like some sort of literary perfect storm for me. It was one of my most anticipated releases of the year, to the point at which, when I received the eARC approval notification, I literally stopped everything I was doing to start reading this. All I can say is that it did not disappoint. Some people call it intuition, others second sight. That tickle at the edge of your senses, telling you there’s something more. Cassidy is able to see ghosts, and to travel beyond the Veil, thanks to an accident that left her somewhere in between the living and the dead. Despite the bizarre nature of her everyday life, Cassidy is such a level-headed, calm child, and I loved that about her character. Even as a kid, I could never relate to MG protagonists who were particularly reactive or prone to outburst, because that wasn’t my personality, and I would have lived for a main character to see myself in like Cassidy. She has this “old soul” quality to her that’s so charming and sweet. Crossing the Veil is like opening the closet door. Of course, the difference is, monsters aren’t real. The closet was always empty. The Veil… not so much. I absolutely adored the world Victoria created here, and thought the Veil itself was a delightful touch. I loved the idea of this semi-tangible thing that Cassidy could cast aside to enter the world of spirits, and you can tell that the entire dynamic of the Veil is one that Victoria has thought out in complexity, from the consistent rules it has. I was delighted to see that, even in a children’s story, Victoria cut no corners. The living may take strength from love and hope, but the dead grow strong on darker things. On pain and anger and regret. While I do consider City of Ghosts spooky enough to be considered horror, I think it’s going to be important for readers to keep in mind that this book is middle grade horror—it’s written for children, not adults. I’m seeing a lot of negative reviews from long-time Schwab readers who feel that it isn’t scary enough or is too predictable, and obviously everyone has the entire right to their own opinion, but to offer another perspective: as someone who is a long-time middle grade horror fan, I feel that this story absolutely excels at accomplishing its goals. That said, it is on the lighter end of the MG horror spectrum, so if you’re looking to hand a copy of this to a kid in your life, I’d say it’s suitable as long as they aren’t terribly easily frightened. But we both know Jacob’s not a normal ghost, just like I’m not a normal girl. Not anymore. There was an accident. A bike. A frozen river. The last thing I want to touch on is Cassidy’s best friend, Jacob—a little ghost boy who saved her life, and in the process, became tangled up in her everyday world. He stays in her home with her, and her parents have more or less accepted his presence, even. He’s supportive and protective, an absolute delight of a character. He’s a perfect best friend to Cassidy, and he’s so precious that I just wanted to squeeze and protect him. I wish I could slip my hand into his. Give him some of my warmth. But all I can do is promise that I won’t let him freeze. That I’ll never leave him behind. Where you go, I go. Of course, this book is by Victoria Schwab, and I don’t know if the woman is altogether comfortable with writing a story without any sadness. Without spoiling anything, there’s a conversation that occurs at the end of City of Ghosts that has me simultaneously eager and incredibly nervous to continue the series, because, well… let’s just say that it feels like some very uncomfortable foreshadowing, and I don’t think even the kiddos are safe in Victoria’s worlds. If we were in a comic book, this would be our origin story. Some people get a spider bite, or a vat of acid. We got a river. Honestly, City of Ghosts was literally a flawless read for me. It held all of the charms and whimsy that I love so much in MG horror, with the added bonus of Victoria Schwab’s gorgeous storytelling and characters. I am so happy that I pre-ordered a finished copy of this ages ago, because I know I will reread it time and time again, and I cannot wait for the announcement of the second book! All quotes come from an advance copy and may not match the final release. Thank you so much to Scholastic for providing me with this ARC in exchange for an honest review! I’m glad to hear it is living up to what looks like an amazing read. The only thing I was worried about was it veering into Encyclopedia Brown territory but doesn’t seem like it does. Just out of curiosity though- based on your review– does the connection between her and Jacob go too far into the romance side of things? Oh, and no, no romance! They have a very cute little platonic friendship. Good luck (and have fun)! Eeeeek I’m so excited for this! It’s soooo excellent – I hope you love it! Thank you so much, Dorine! Okay I was kind of wary about this because it’s MG but wow, you’ve convinced me maybe I should take a look! Yay! I hope you enjoy it if you do read it! Oh man I already really wanted to read it but somehow you’ve made me even more excited about this book, it sounds amazing!!! Middle grade horror might be the perfect amount of scary for a wuss like me 😂 and I love Victoria Schwab so I’m excited to check this one out! Hahaha perfect!! I hope you like it! Destin, how are your reviews so good? Now I have to add this to my tbr! Aww I’ve so been looking forward to this book already, and now I can’t wait to read it even more! *twitches* Waiting is one of the worst things about books. D: Great review! Very true! 😂 But at least it does come out pretty soon so hopefully you won’t spontaneously combust or anything. 😂💕 thank you! Fantastic review! I am so excited to read City of Ghosts. Thank you! It’s so good. I hope you enjoy it! Excellent review, I am really excited for this one!!! SO. GOOD. Just be sure to go into it expecting a MG level of paranormal/horror and not an adult level or even YA – that seems to be what is tripping up a lot of the reviewers I’ve seen ranting about this one. With you on the ‘perfect storm’: love V, love Edinburgh, can’t wait to read this!